I suppose this doesn’t really count for the pattern challenge, but since I haven’t picked out a pattern for my birthday dress yet, this will have to due. 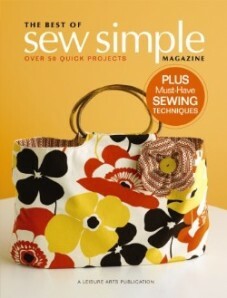 I’m suppose to be using this book to teach a Spring Break Sewing Camp at SewFlakes later in March. Unfortunately the two projects I’ve done out of the book so far have proven that the instructions are faulty, not making this the best book for beginners. Following the instructions for the Smock Top I had to rip out seams twice, though the second one was mostly my fault. When it came time to attach the band to the bodice piece of the top I totally disregarded the book. I wouldn’t suggest that anyone get this book who didn’t already have some knowledge of how things are suppose to go together properly. Thankfully, Chris, my boss, was close by the whole time I was working on the top and she was able to show me how to make it all work out. The main fabric is an Alexander Henry. After going through the complete process I’m confident that the next time I make this top it will come together a lot quicker and easier. (Touch wood.) In the mean time I’m glad to have this done. Now I just need to get a new seam ripper since mine is dull! The Big Huge Mondo Sale at SewFlakes this morning was an insane success! We had people lined-up down Main street waiting to get in as soon as we opened at 7:00am! When I arrived at 7:06 (36 minutes after the time I was suppose to be there…go figure! ), via the back door, I had to maneuver my way to the register. Once I got to my “station” I didn’t move from it until 1:45pm! Yes, we were that busy! All this makes me so glad that the employees were able to shop at the discounted rate for an hour after close of Friday. 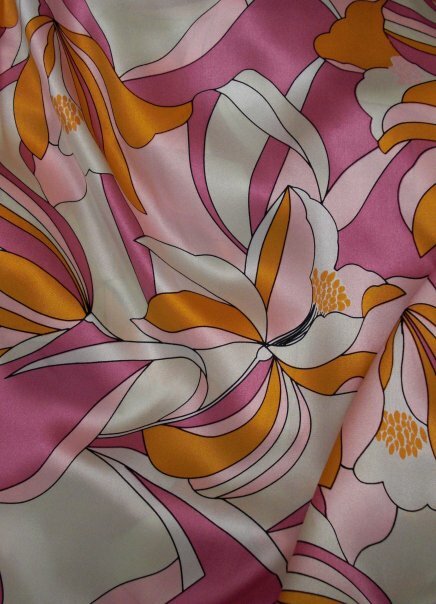 If we hadn’t been able to I might not have gotten the perfect fabric for my “Birthday Dress”. Most of my pictures are taken after dark, so the fabric isn’t as dull as it looks in the here. This silk piece was in the sale area already marked down 50%, but because of the sale it was an additional 50% off! The original price was $24.50 a yard, and bought 3 1/4 yards for $19.91! It is going to be perfect for a cute, fun, flirty, but not to “flaunty” birthday dress. My only problem is not knowing what pattern to use! To help solve this I put all the pictures in an album on my Facebook where my friends can vote for their favorite. Each vote counts for 1 entry into a prize give-away made custom for the winner, and each person can vote up to three times by clicking the “like” button under their favorites! 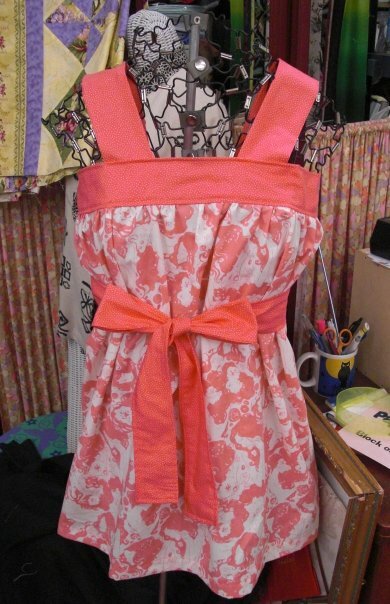 More good news about this dress is that I came across as “sew-along” type group in the Sew, Mama, Sew Forum today. It is called “Pattern Challenge” and is being hosted by Sarah. The idea is that that you make a goal, work towards that goal, and share its progress with the group as you go. If you want to learn more, you can click the badge below. I’ve never sewn silk before, so this is sure to be an experience. Thankfully, I have until May to get it done! P.S. If you want to become a friend on Facebook, please include a short note with your friend request letting me know where you found me. Thanks. These are in no particular order. I’m sure the list will grow as the year unfolds, but this is a good starting point. 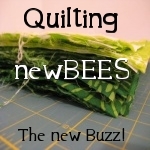 1) I want to open my Etsy show and sell the things I make. I really love fabric and sewing, so it wouldn’t hurt to find a way to sustain my hobby. 2)I want to enter into a Tulsa State Fair contest. I have a photograph I took a while ago at the Tulsa Air and Space Museum that is at the very least advertisement worthy. 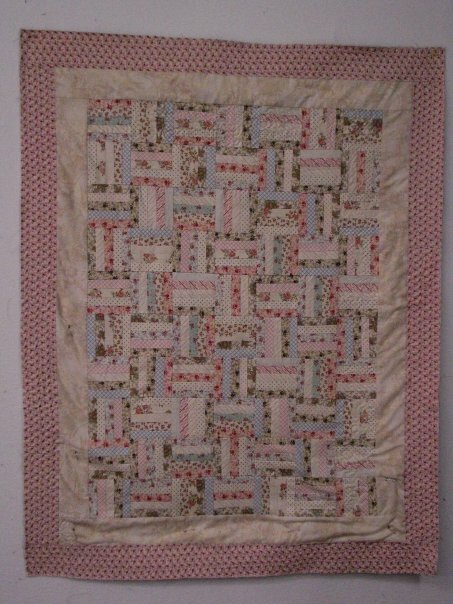 On a more practical note I will most likely enter into the quilt or table setting contests. I think it is kind of silly that there’s a table setting category, but it would be fun all the same. If I enter into that category I won’t use plastic ware, I will paint my dishes to match the setting, and if there are flowers they will be my own arrangement, not some bouquet from the store. 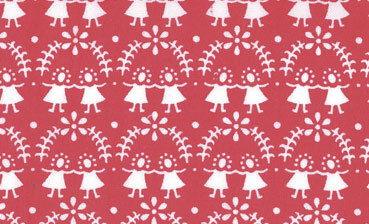 3)I would like to publish a pattern to make available for sell. I’m not sure what sort of pattern it will be -probably a bag or apron. Either way it would be so encouraging to see someone buy and make something I have designed! 4)To design a complete outfit and sew it together proper would be a great achievement. Imagine me walking in to a Utica Square boutique wearing a marvelous three piece outfit and selling my clothes there! This goal starts relatively small and morphs into something extravagant quite quickly I realize, but you just never know what will happen if you give it a go! In all reality I don’t plan on becoming a fashion designer. (I would have to be able to sketch for starters and I can’t.) I don’t even really plan so much on making clothes to sell in a mass production sort of way. It would be nice to make something, wear it around, have someone notice and like it, and then make that person their own custom outfit. The experience would be really gratifying in itself, being paid for it would be an added bonus. 6) The last one I have, so far, is shrimp. I am going to learn to cook shrimp in such a tasty, sophisticated way that I will completely forget they are the cockroaches of the sea.